James Thomas Leslie, Jr., M.D. Provide comfort for the family of James Leslie, Jr., M.D. with a meaningful gesture of sympathy. Dr. James Thomas Leslie, Jr. of Jefferson City passed away peacefully Wednesday, December 19, 2018 at the age of 96. He was living at Heisinger Bluffs. Born at home on August 12, 1922 in Rhineland, Missouri, Jim was the sixth child of Dr. James and Ella (McAfoos) Leslie. His family moved to Jefferson City when he was 5, where he attended Moreau Heights Elementary School and graduated from Jefferson City High School in 1940, having been a State Champion swimmer and accomplished golfer. He was honored as the Jefferson City Distinguished Alumni in 1989. Like many men of his generation, Jim attended college during WWII in the Army ROTC program, and was called to duty while studying in Baton Rouge, LA. He came home after training in the Army, and attended the University of Missouri’s two year Medical School. He then finished his medical degree at Louisiana State University in New Orleans in 1947. It was during this time that he fell in love with Gloria Borregard, who he married on May 5, 1946. Together they shared a wonderful 72 year adventure until her death in June, 2018, at the age of 92. After completing his Orthopedic Residency at Stanford University in 1955, he proudly served his country in the United States Air Force during the Korean War retiring as a Lieutenant Colonel in 1961. By this time, Jim and Gloria had four sons, and after many moves during his medical training and military service, they chose to make Jefferson City their home in 1960. Along with Dr. Fred Tietjen, Jim founded the Bone and Joint Clinic, Jefferson City’s first orthopedic practice. A skilled surgeon, he developed the shoulder repair technique known as the Anterior Axillary Incision, which was published in Campbell’s Operative Orthopedics, the definitive authority in Orthopedic Surgery. After a distinguished career at the Bone and Joint Clinic, Jim joined his youngest son, Chris, in practice at Leslie Orthopedics and Sports Medicine at the Lake of the Ozark, where he continued as a consulting physician and mentor for many years. Being a proud Jefferson City Alum, Jim volunteered for more than 50 years as the Team Doctor for Pete Adkins and the Jays football team. He could be found on the sidelines on Friday nights at both home and away games. He was inducted into the Missouri Sports Hall of Fame in 1987 for his outstanding career as a Sports Medicine physician. Jim was a 50-plus year member of First United Methodist Church where he taught Sunday School, and was active in Bible Study. He served on the Board of Directors of Jefferson Bank, was a member of Phi Delta Theta fraternity, and served as Chief of Staff at Memorial Hospital. An avid golfer, he was a member of the Men’s League at Jefferson City Country Club, and two time Club Champion. 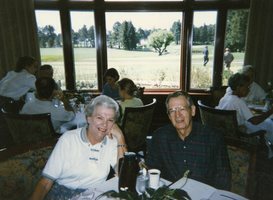 He and Gloria traveled the world enjoying golf, boating, white water rafting, cruising and experiencing all cultures and cuisines. Family vacations often included golf, horseback riding and always adventure. Jim was a voracious reader and often had piles of books and articles by his chair. He was a life-long learner and participated in the Learning in Retirement offerings when possible. Gardening was another passion he pursued, with a yard and home full of beautiful and often exotic offerings. He was a prolific writer, especially poetry, and often shared his wit and wisdom in verse. Most importantly he cherished his family and gave generously of his time with those he loved, who called him Dad, Grandpa, and Da. Jim is survived by three of his sons: Dr. Terence Leslie and wife Donna of Independence, MO, Dr. Christopher Leslie and wife Susan of Sherman, Texas, and Jay Leslie of Jefferson City; four grandchildren: Suzanne Leslie (Brad), Andrew Leslie (Sabrina), Jeffrey Leslie (Tara), and Sallie Leslie House (Tyrus); six great grandchildren: Cade, Blair, Julian, Wes, Jack and Kit. He was preceded in death by his parents, his wife Gloria on June 7, 2018, his son Scott Leslie, his brother Paul, and his four sisters: Lucille Sowder, Leone MacDougall, Virginia Livengood, and Frances Harrell. He was a man of great integrity and faith, who will be missed by all who knew him. Visitation will be at Freeman Mortuary from 2:00 until 3:00 pm Saturday, December 29, 2018. Funeral services will be conducted at 3:00 pm Saturday, December 29, 2018 in the Freeman Chapel with the Reverend Chelsey Hillyer officiating. Graveside services and interment with military honors will be conducted at Riverview Cemetery. In lieu of flowers, memorial contributions to the First United Methodist Church are suggested. 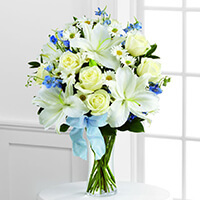 To send flowers in memory of James Thomas Leslie, Jr., M.D., please visit our Heartfelt Sympathies Store. Karen & Lee and Larry and Chris Borregard and Family have sent flowers to the family of James Thomas Leslie, Jr., M.D..
Karen & Lee purchased the The FTD Sweet Peace Bouquet for the family of James Leslie, Jr., M.D..